I really enjoyed this movie the first time I watched it, I was very happy that it was essentially a continuation of the successful trilogy that began 15 years prior and not a typically Hollywood reboot. There just seemed to be a few nagging problems that kept taking me out of the narrative. These problems seemed to boil down to a couple bad casting/ bad storyline choices. I set out to remove these and make this film the best it could be. Don Skonecki for creating my cover art. I removed several made for TV style scenes and story choices that really took me out of the film the first time I watched it. I also encoded the foreign language subtitles directly into the video for easy streaming over the internet or a media server. The first issue I chose to correct was the film's opening sequence set in Budapest. This sequence stars Josh Holloway of LOST fame and Paula Patton. Josh turns in a very made for TV performance in these scenes and it really took me out of the film. This sequence wraps up on an odd sort of secret lovers scene between Josh and Paula that was very made for TV and seemed out of place since we barely know these characters. This sequence has no bearing on the film until after the prison sequence in Moscow so instead of visiting the sequence twice in the first 15 minutes of the film, I have just cut it and replaced it where it falls naturally. The other major scene correction occurs at the party in Mumbai. Here we find Anil Kapoor playing a very made for TV Indian billionaire character. His interaction with Paula Patton has been cut down to the essentials removing primarily the hide-and-go-seek game. Also cut here is the odd romanticism inserted between Cruise's character and Paula's character. We spend most of the movie wondering what happened to Ethan's wife making this feel very out of place. 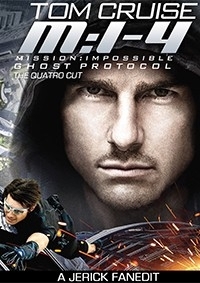 Other than that there are a couple blink and you'll miss it corrections and the number 4 added to the movie's title to remind viewers that this is in fact a continuation not a reboot of the Mission Impossible franchise. I also wrote all the foreign language subtitles and encoded them into the film for easy streaming. It's amazing how much difference a few minutes can make. In the run up to Mission Impossible Fallout I rewatched the previous films but kept an eye out for fanedits that would address my issues with some of the other films. 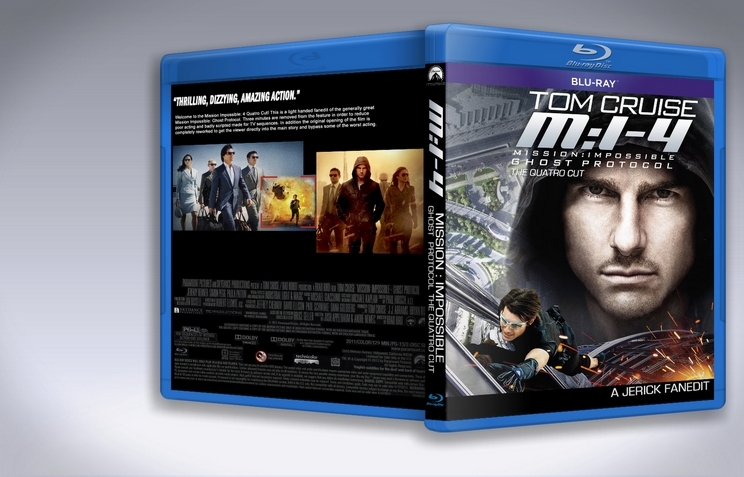 This was one of the ones I chose (the other being MI II...) and while I didn't have much of an issue at all when Ghost Protocol was originally released, after reading over Jerrick's subtle cut choices I thought it would heighten this film. This it did, highly recommended. Then Jerick comes along and improves it. All the cuts are done masterfully and are invisible. The enjoyment is heightened, the narrative improved. Thus, this edit enhances my thoughts regarding MI4. A wonderful edit executed to great effect considering the few trims made. The Budapest opening is moved and reworked into a fitting use; no forced romance whatsoever; less Bollywood. Solid work. I have no reason to watch the original in the future. This is it. Well done, Jerick! Fantastic edit, this shows that even just the tiniest of changes can improve things massively and I look forward to your Hunger Games edit! I thoroughly enjoyed this edit. I meant to catch this in theaters and just never got around to seeing it. I picked it up pretty cheaply and watched it a month ago for the first time in preparation for Rogue Nation. I thoroughly enjoyed it. You pretty much picked off the two or three weak spots in the movie and fixed them. This is a pretty light edit but it manages to strengthen the narrative (by not having me ask out loud who the f#&% everyone is like I did when I saw the theatrical cut) and getting rid of the Cruise/Patton sexual tension which muddled everything with his wife. I really liked the theatrical, this is just a bit better. Replacing my disc with this one.